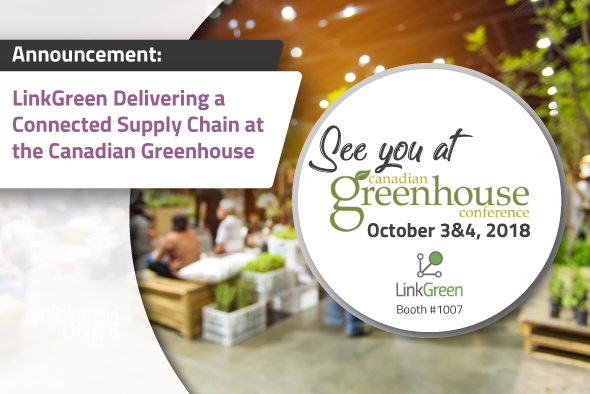 On October 3rd and 4th, LinkGreen will be exhibiting at Canadian Greenhouse Conference, one of Canada’s most prominent events for greenhouse flower, vegetable, cannabis, berry and nursery growers. LinkGreen invites attendees and exhibitors to stop by booth 1007 and learn how their wholesale ordering solution provides online and mobile ordering, product information management, and marketing and promotion strategies for growers, distributors, and retailers. An efficient supply chain benefits everyone from growers to the consumers and industries like the automotive sector have widely adopted systems that connect their supply chain and help build efficiencies into their operations. Meanwhile the greenhouse, horticultural, and now cannabis industries continue to operate in an inefficient, disconnected supply chain. LinkGreen, a North American technology company, has developed a technology solution for the greenhouse and floriculture sector, specifically designed for the unique needs and challenges that accommodate live green good transactions. A more transparent and connected supply chain results in a more efficient one. LinkGreen is working with greenhouse growers and distributors like Rosa Flora to better connect their supply chain to reduce costs and offer seamless transactions. Through LinkGreen’s technology, distributors gain full visibility over their grower's inventory and make that information available to their customers and sales reps as they place their orders. This removes any manual processes and offers complete automation and transparency over the transactions between business partners. Taking the ordering experience even further, LinkGreen has recently released barcode scanning for retailers and sales reps. Canadian Greenhouse Conference attendees are invited to experience firsthand how LinkGreen is making wholesale ordering fast and easy.